We walk through the door to Cho Cho San and are immediately captivated by the space. Designed by architect and interior designer George Livissianis, the dining room is striking and simple with an industrial chic style using predominantly shades of white and cream. The long bar is the star of the show with an impressive selection of different sakes and spirits. The restaurant is full and buzzing on a Sunday night. Our table isn’t quite ready so we take a seat at the bar and sip on a glass of NV Laurent Perrier Brut Champagne ($22). The staff are very professional, chatty and knowledgeable. Our barman takes us through the menu and evening specials giving explanations of the dishes and sharing his personal recommendations. Once seated at our table we order some natural oysters with kombu and wasabi ($4 each). 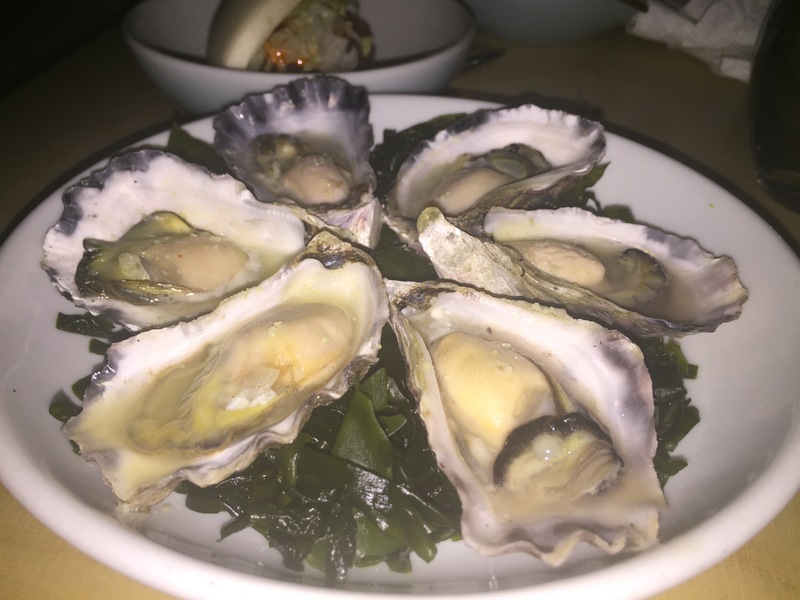 Wasabi on oysters – a first for me and it was very enjoyable indeed. The wasabi paste was quite subtle letting the fresh sea flavours of the oyster flavour shine. 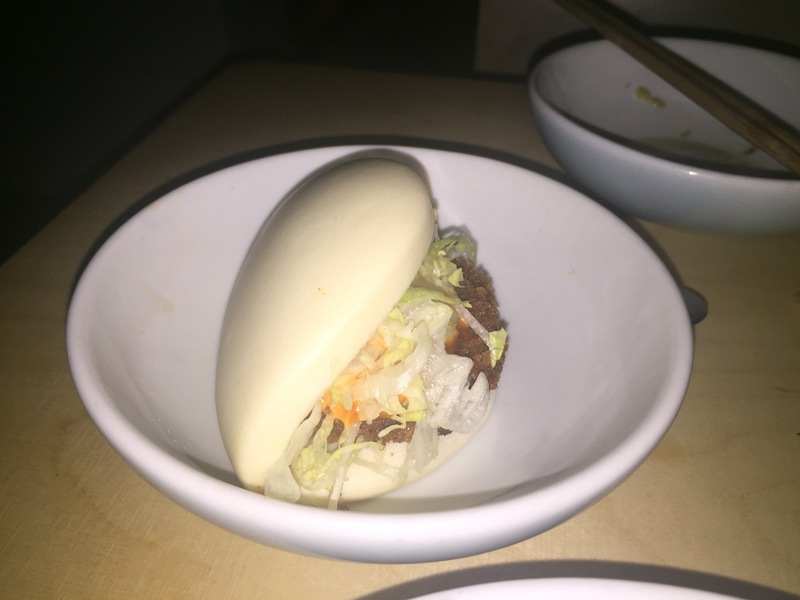 We also order a couple of pork katsu steam buns ($8 each). The bread is fluffy and the pork is full of flavour. The restauranteurs and chefs at Cho Cho San are not Japanese and don’t have a history in Japanese restaurants but it’s evident in the food that they know exactly what they are doing. The modern take on Japanese techniques and flavours is refreshing. Next up is the kingfish sashimi with ginger, shallot and chilli dressing and pickled cucumber ($23). It was a recommendation from our bar tender and it exceeded expectations. 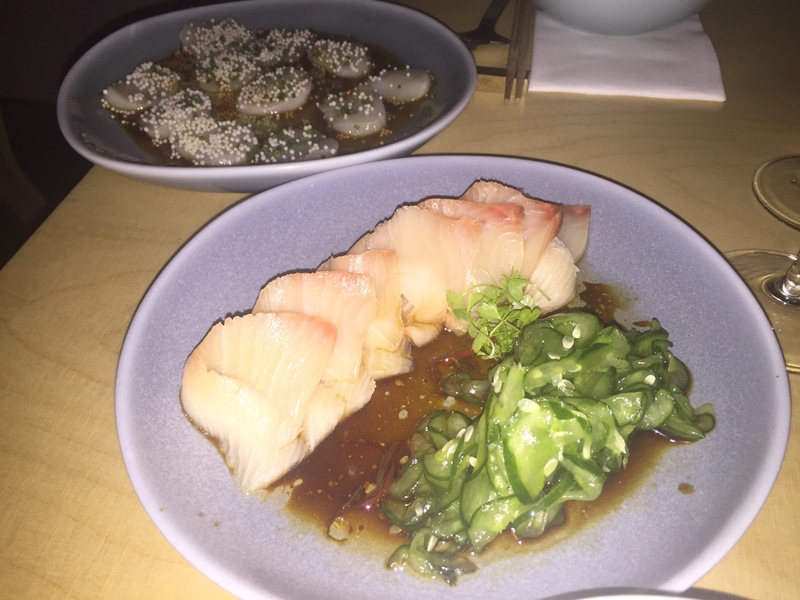 The scallops ($25) have been cooked perfectly and are dressed with a beautiful sweet ponzu dressing. The puffed rice scattered on top of the scallops absorb the ponzu and add a wonderful crunch to each bite. 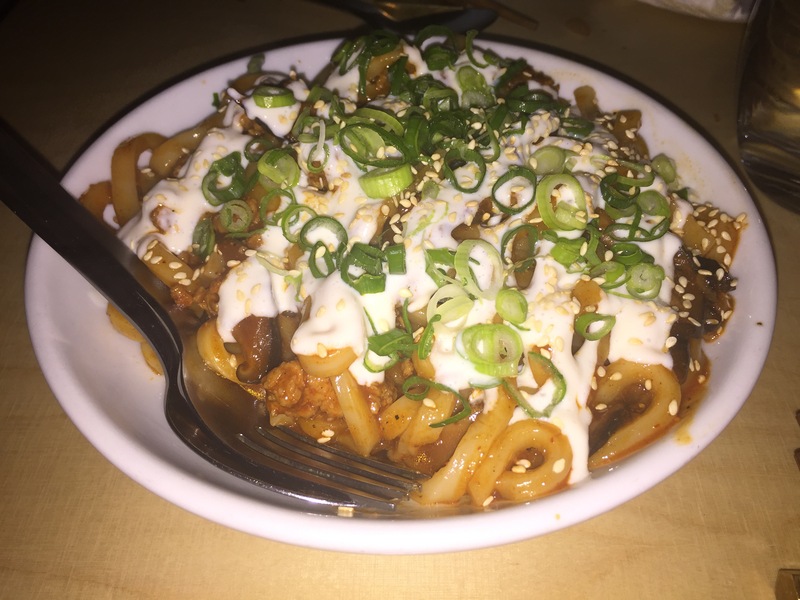 The Japanese Bolognese ($18) is a fun fusion of Japanese and Italian made with thick udon noodles and a nice spicy kick in the tomato sauce. Similarly the dessert menu is a remarkable blend of Japanese flavours and techniques with an array of western dessert styles. We tried the black sesame ice cream mochi ($6). For those who aren’t familiar with Mochi, it’s a type Japanese rice cake made of mochigome, a short-grain japonica glutinous rice. The rice is pounded into paste and molded into the desired shape. Our dessert has a beautiful outer layer of mochi and is filled with fluffy black sesame ice cream. 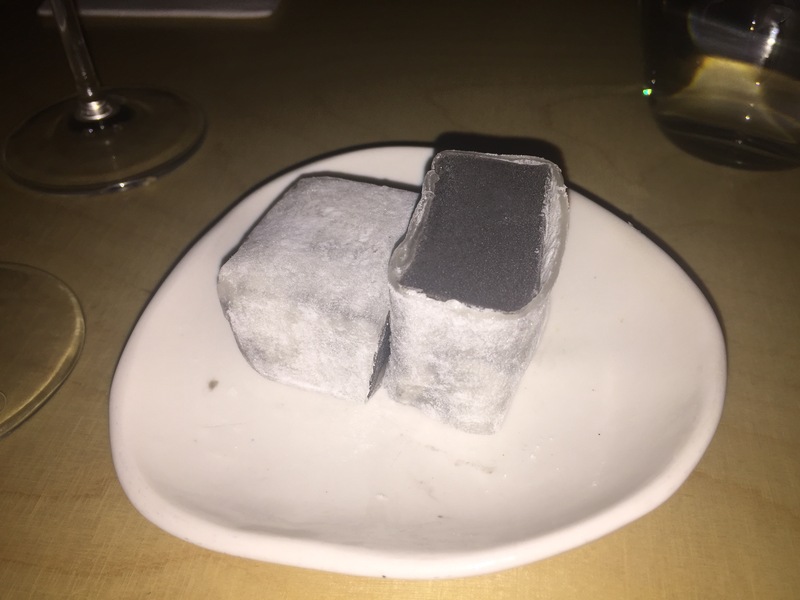 The two perfect pieces of cube shaped ice cream look striking on the plate with beautiful white and charcoal colours. Biting into the dessert is a sensational feeling. The black sesame fills your mouth with exquisite earthy flavours and the slightly chewy mochi layer on the outside is much sweeter in contrast. A glass of Japanese whisky is a perfect accompaniment to the black sesame ice cream. Finally, the Macha tiramisu ($12). When I spotted matcha tiramisu on the menu I thought this could either be a really great dessert or has the potential to be a very bad one! I love authentic Italian style tiramisu and am dining with my close friend who happens to be Italian and has had plenty of delicious traditional homemade tiramisu in his day. 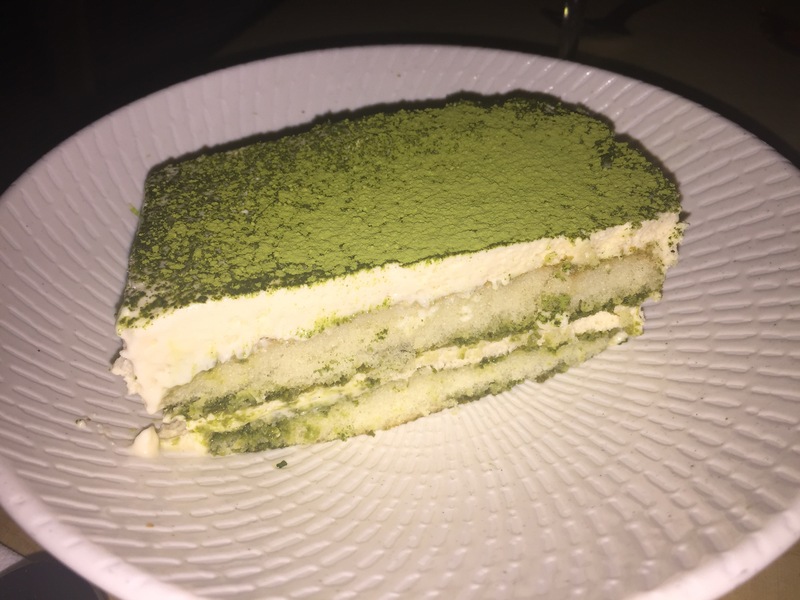 But the team at Cho Cho San didn’t disappoint – the generous serving of tiramisu had a great texture and flavour and the matcha wasn’t too overpowering. Other interesting desserts on the Cho Cho San menu include sour plum swirl soft serve ($6) and a sticky date miso pudding ($12). I will definitely be back to try these as well! Overall a fabulous spot for modern Japanese – delicious food served in a sophisticated industrial chic restaurant space with excellent service and a very affordable menu too!